This is an easy and tasty casserole. We like ours with rolls or cornbread. I use home canned tomatoes for this and they taste so good that they make you think of summer. We need that on Beaty's Creek today, it is cold and breezy. Salt and Pepper pork chops and brown on both sides. I do this in the same covered pan that I cook the casserole in. 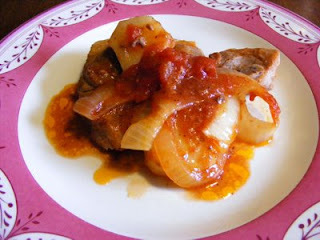 Once browned, layer in this order, pork chops, potatoes, tomatoes, onions, and tomato sauce. Cover and cook for 1 hour and 45 minutes in a 425' oven. The gravy this casserole makes is so good to eat with fresh bread. Well that is "what's cookin" tonight on Beaty's Creek.